A couple weeks ago, I was at home, being bored while Alex was up in Fargo visiting my brother with my other brother & brother-in-law. Ah, boys weekend. Anyway, I was home and pretty bored and I got to thinking about how I had not knit my niece anything in awhile. Enter the Vine Flower Dress. I started searching on Ravelry for dress patterns. And, the second I saw this Anne Hanson gem, I knew it was the one. I bought it, shopped my stash and got started. Caitlyn is a very tall baby, so I knew I probably would have to modify it a little bit. So, I ended up knitting the largest size for the skirt, decreasing extra to get down to the smallest size for the body and added 2 extra inches in the body to account for her height. I was a little worried about making all these changes, but it was worth it. The dress turned out to be a great fit. My sister said that she has already gotten so many compliments on it. Someone told her that I was very talented. Ok, yes, I am a good knitter, but this was all the pattern. This pattern is so unbelievably beautiful. And, it was so well written and the construction is easy, it really isn't me with the talent, it's Anne Hanson! The yarn I used was Valley Yarns Superwash DK from Webs. I had bought it last year with plans to make Caitlyn a sweater with it, but I am so glad I didn't do it. 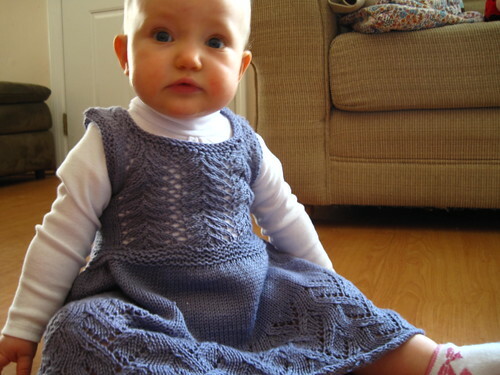 The dress and the yarn together are a perfect combination! I can't wait to find something else mega cute to knit my niece. Any ideas?